I should come totally clean here. I don't really cook all that often. Wil cooks, I cobble. 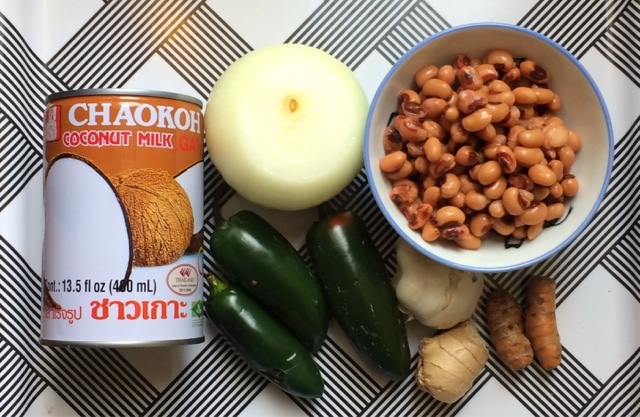 So this project of making some Tanzanian recipes has been both interesting and challenging. For this week's recipe, I wanted something different ... and perhaps a different type of meal. I found a recipe for Mandazi and Barazi on Sanjana's korasoi.com food blog (a great resource for vegetarian recipes from East Africa and India) that sounded delicious ... but I didn't want to faff with waiting for dough to rise before breakfast ... and because I couldn't find a key ingredient, well, I figured I should find perhaps a more complicated recipe that would have additional flavors. Barazi (also called Mbaazi wa Nazi) is a porridge made from pigeon peas, coconut milk, and spices that's commonly served for breakfast. One key problem: I had NO IDEA what pigeon peas were, and where to find them. T'internet told me that pigeon peas are also known as gungo peas in Caribbean cooking; gandul, guandu, or chicharo in Latin America; toor dal, towar, tovar, or tover ki dal in various Indian languages. I struck o ut at my local supermarkets (though I may just not have brought a complete translation list with me...), and even attempted to find them at East African Imports, but to no avail. I also read that black-eyed peas were a good substitute ... so went with it. I think it affected the color of my finished dish -- not green, but golden -- but don't know how it affected the taste. The barazi was super easy to put together -- basically just chop up all the ingredients, sauté the onion in a bit of olive oil, add everything else but the coconut milk and the peas and sauté a little longer, and then add the peas and coconut milk and let simmer for a while, stirring more often as the porridge thickens. While the barazi was simmering away, I made my first attempt at Mandazi. Commonly translated as "beignets" or "African donuts", these deep fried bits of delicious dough are seasoned with cardamom and coconut. Traditional recipes call for yeast and time for the dough to rise and prove ... but I didn't want to wait. Luckily AfricanBites.com had a simple recipe for "easy mandazi" that seemed more my speed. It's your typical "dough" recipe ... combine dry ingredients, combine wet ingredients, then combine the two together, slowly. Roll out the dough, shape into triangles, and deep fry. The most complicated part was braving the deep fryer and managing not to burn myself while turning the little guys. A delicious breakfast of little not-quite-sweet-but-slightly-spicy dough triangles dipped in a rich, hearty porridge. 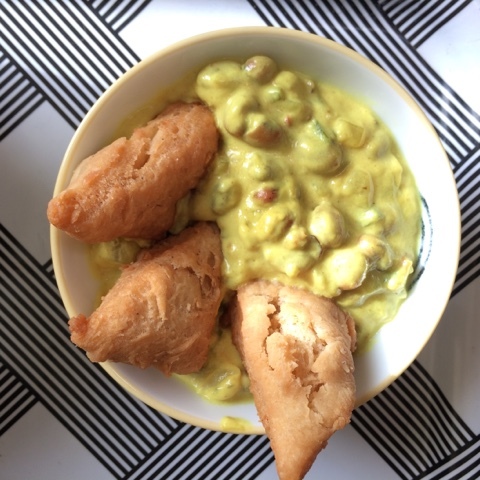 I would make this again -- and I can't wait to try "proper" mandazi because they'll be light and fluffy. Adapted from K.O Rasoi's "Barazi" recipe. 15-ounce can black-eyed peas -- or, heck, use proper pigeon peas if you can find them! Sauté the onion in olive oil until translucent, 3-5 minutes. Add remaining ingredients except for peas and coconut milk; sauté an additional 5 minutes. Add peas and coconut milk, simmer on medium heat for 30 minutes. Porridge will thicken as it cooks; stir more frequently the thicker it gets. 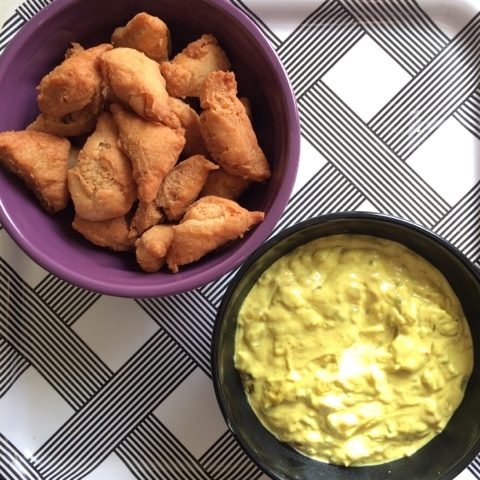 Adapted from Immaculate Bites "Easy Mandazi" recipe. If desired, powdered sugar or cinnamon sugar for dusting. Combine dry ingredients in a bowl until well blended. Combine wet ingredients in a bowl until well blended. Slowly add wet ingredients to dry ingredients and stir until dough is smooth. If dough feels too sticky, add a little flour. If too dry, add a little water. Roll out dough to 1" thick or less. Cut in bite-size triangles. Fry in vegetable oil at 350 degrees until golden brown; 3-5 minutes per side. Make sure the mandazi have room to move around -- in my little fryer, I fried this recipe in 4 small batches. Remove from oil and drain on a paper napkin. If desired, dust with powdered sugar or cinnamon sugar. Serve warm, with barazi or a mug of chai.